William Stieglitz composes plays, pens poems and writes stories, too – all examples of his deep interest in creative writing and journalism. “There is so much you can do with your imagination,” William said while holding a notebook of his stories. William participated in an all-day play-writing session called “8 Plays in a Day,” where he wrote a play about two women arguing over parenting styles at a restaurant while the waiter was trying to break up the fight so he could take their order. William takes what he learns from his favorite classes, especially chemistry, and applies it to his writing. He wrote a piece on particles’ motion and used that to symbolize how nobody can ever be completely evil because there will always be good to influence them. It’s a lot like how absolute zero can never be reached by particles because there are always factors influencing them, like motion. William was on his middle school newspaper, The Osprey, for three years and his high school newspaper, The Kaleidoscope, for one year where he writes about art related events that take place in his school. 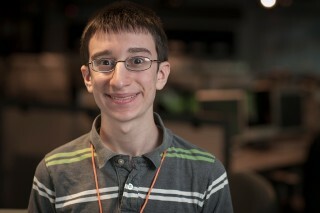 He is excited to be a part of the Greene Team this summer, but is also nervous. He looks forward to learning about the different types of journalism. In William’s spare time he enjoys video games and reading. The Adventures of Huckleberry Finn by Mark Twain and The Outsiders by S.E. Hinton are some of his favorite reads. “William has a creative mind and is very enthusiastic,” said his brother Josh. William often struggles because it is hard for him to keep up with work because he works at a slow pace. He tries to overcome this by focusing extremely hard on his work while analyzing and thinking about what he is doing.